If you want to add this pattern to your Ravelry queue, you can find the pattern here. My parents came to visit in December, I hadn’t seen them in a long time. They brought with them the memories of old times, when my sister and I were kids, of Christmas breaks spent on a sled and with a new toy in my arms. One of these toys is a teddy that my mom made for us (I’m not sure for which one of us), that ended up loved and squished and stretched by little hands. All I remember is the soft red plush fabric and two purple sequin eyes, but I’ll never forget the joy it has brought me. 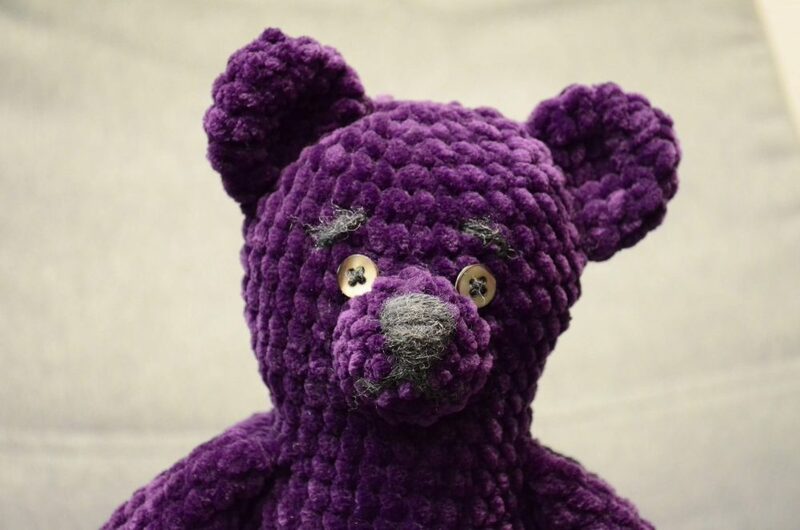 I wrote an amigurumi pattern for a similar bear, but I’m still working out the kinks in the final product. I wanted to publish it in time for my birthday, which was 20 days ago, but it didn’t happen. 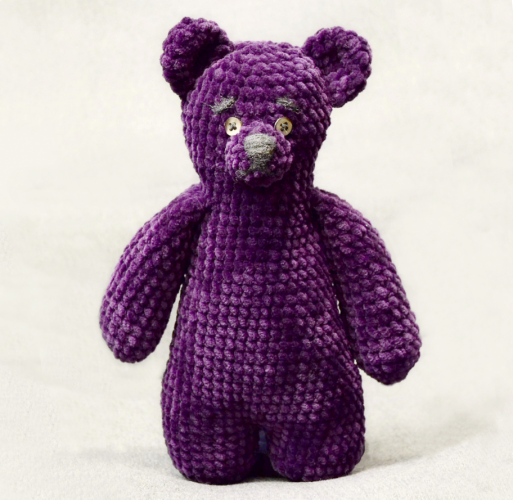 I somehow managed to make two patterns for two similar bears in two sizes. I was overwhelmed by testing both patterns, as I wanted to finish them up and publish them really quickly. I’m not super happy with how this one turned out. I like it, but maybe I should have chosen another color for the test. Maybe the future versions will be more kid friendly. Or maybe my opinion of what kid friendly means is just that, my opinion. I’ve been seeing children carry and pull around all kinds of toys, so I decided it was time to at least publish the larger version, even if the smaller version is not completely finished yet. 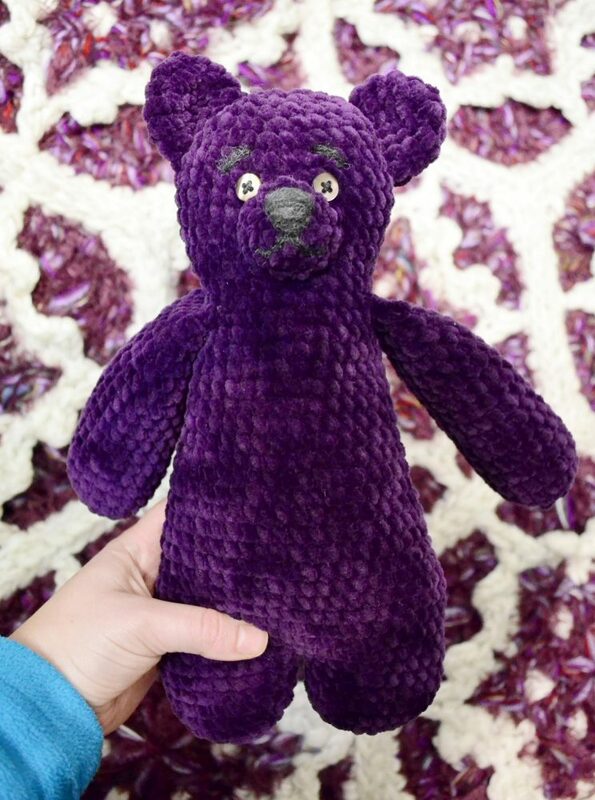 This teddy is quite large, around 30 cm in height if you make it using velvet/chenille yarn, so it’s not very suitable for little children (I mean 3 years-old or younger). If you make it in a thinner yarn, it will be perfect for a little kid. Try it and see, you might just keep it for yourself, it’s very huggable. 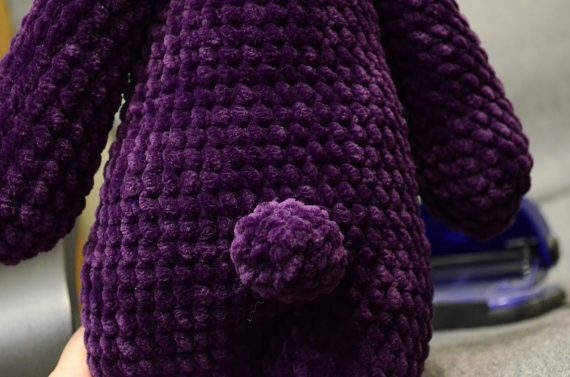 The pattern is very beginner friendly, so even if this is your first amigurumi project, I’m confident you will manage beautifully. I’ll try to find some good links for the “what you need to know section”, as there are many wonderful resources online for learning the basics of amigurumi. contrasting yarn or button for nose. sewing amigurumi pieces to each other. For first leg, bind off. Make 2 legs, don’t cut off yarn after second leg. Stuff the lower part of the body, making sure there is equal stuffing in both legs. Stuff the upper part of the body. Sew the nose in row 38. Put in the eyes or sew them using the contrasting yarn in row 39 or 40. Bind off, use tail to sew the 6 sc together into a ring, pull tight. Bind off, leave tail for sewing. Sew the nose on now if you prefer, with the lower tip in the middle and the two upper points in row 3. Otherwise, leave this step for later, after you sew the muzzle on the head. Stuff lightly, mostly filling the lower part of the arm. Squish the arm and make 6 sc along the two sides. Bind off, leave tail for sewing. Bind off, leave tail for sewing. When you have all the pieces finished, you start assembling them, by sewing the ears on a line that goes along the side of the head between rows 39-43, then sewing the muzzle between rows 33-37. Sew the arms to the body, right below the head (row 32). Sew the tail in the back, between rows 10-13 of the body. I hope you enjoyed this pattern and that you make many happy bears. If you want to show it off on Instagram and you’d also like me to see it, tag me in your post @andi.bede or use the hashtag #bigteddyamigurumi, I’d love to see your version. I hope you enjoyed this pattern and that you’ll tell all your amigurumi-loving friends about it. If you think my work is worth supporting with a skein of yarn, please use the button below to donate and help me hoard more yarn (I’m kidding, I’ll use it all to make more cool patterns). If you want me to let you know when I publish more patterns, make sure you sign up to my newsletter (which only arrives when I actually have something new to share, so make sure you open it, I don’t write two emails about the same patterns).